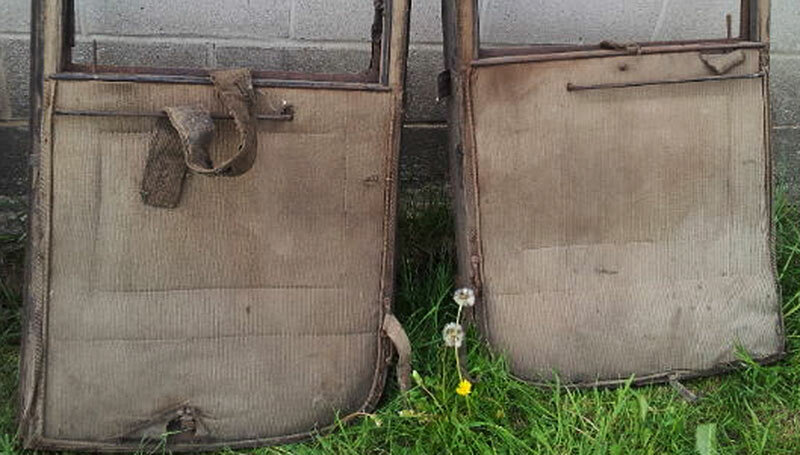 Where are the attachment points for door check straps and how are they attached, and are they behind the interior panels or on top? I have nylon straps from Snyders which I think are correct but the only place they seem to fit is at the top of the door, and I do not see any hardware to attach. This is from the Body parts book. These photos may help also. Locations may be correct. This helps a lot. I think the part I got from Snyders is to 1-2" short, and needs to be mosified to accept the "U" shaped bracket. I'm going to look for this book. Any idea what angle the door should open to? 90 degrees? The first picture shows it almost hitting the rear fender. I would think that is too much. Is the" body parts book" the name of the book, is it available for sale, and where can I purchase one? Most vendors carry this. 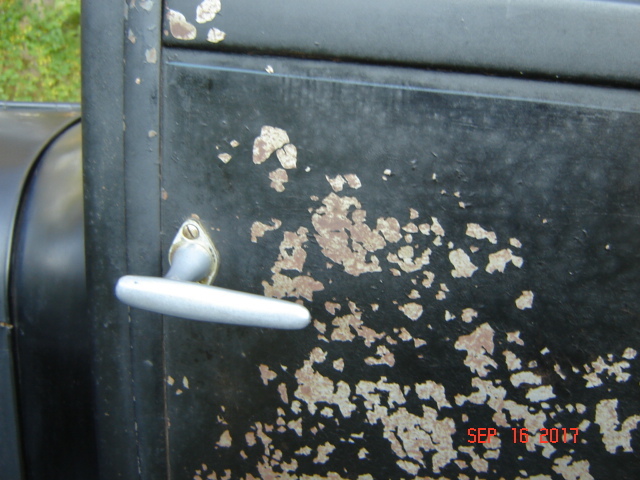 It has 3 good depictions of the suicide door coupe. One of the wood skeleton, one of the finished body and the door open one shown above. 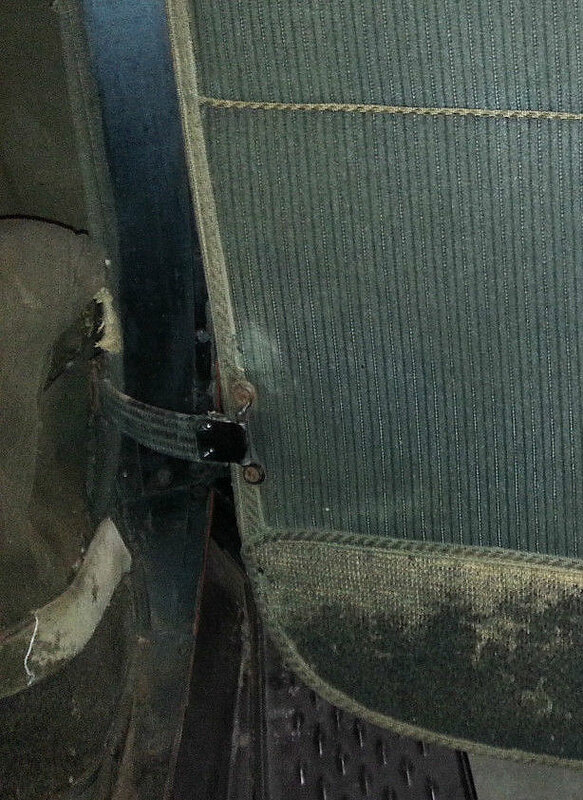 This is how the door check strap looks on our original 1922 coupe. That looks great! 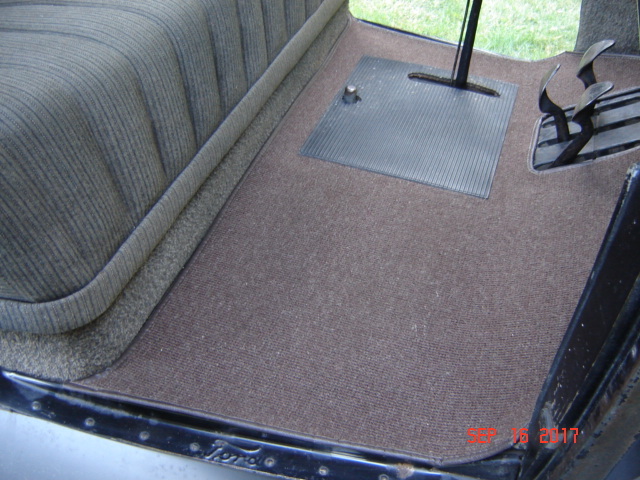 I'm putting a new interior in my 19 now; I had to build the seat support, and have the headliner and seats done so far. 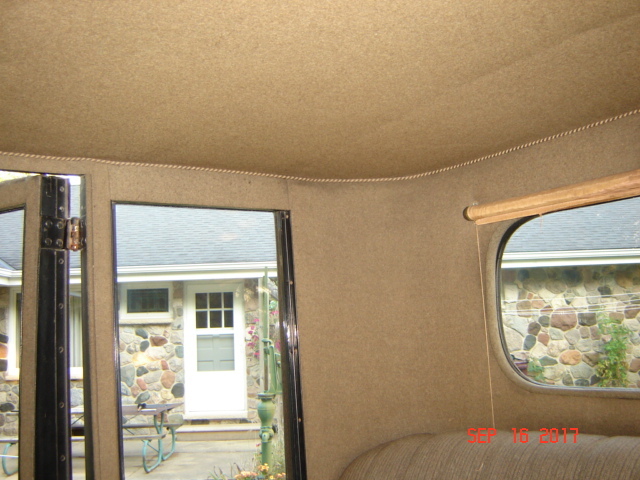 Do you have any other pics of the interior and advice on how and what order to install the pieces? 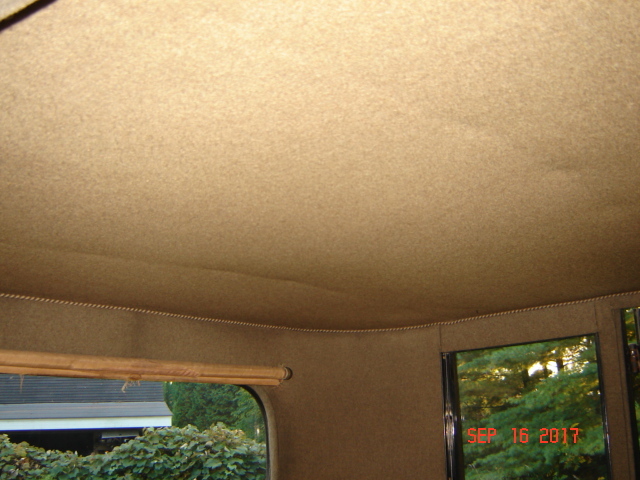 I read that there should be an overhang above the doors to seal the draft, and watch the trim above the windshield so it can still open. I bought my interior from Mac's, and their instructions were skimpy, and combined for both an A and T.
WOW, that is one of the finest original interiors I've ever seen. 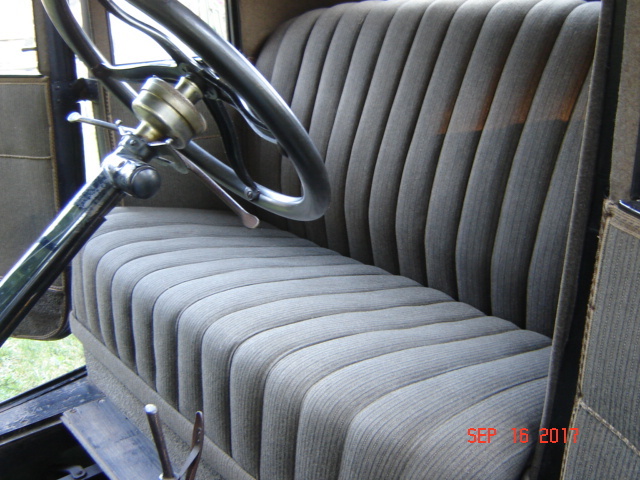 That's a really nice original interior! Looking at Jim R's profile pic with the Coupe the paint looks to be original also. I have to ask if the interior was cleaned. But I am confused. The first 2 photos show a grey interior and the last 3 photos are light brown. Is this the same car or? All of the photos are of the same car, but the lighting makes the colors look different. I do not think that the interior was ever cleaned. It was kept clean and well cared for. Even the plating on the demountable rims looks great. It has original paint, but it does have some peeled paint on the body. 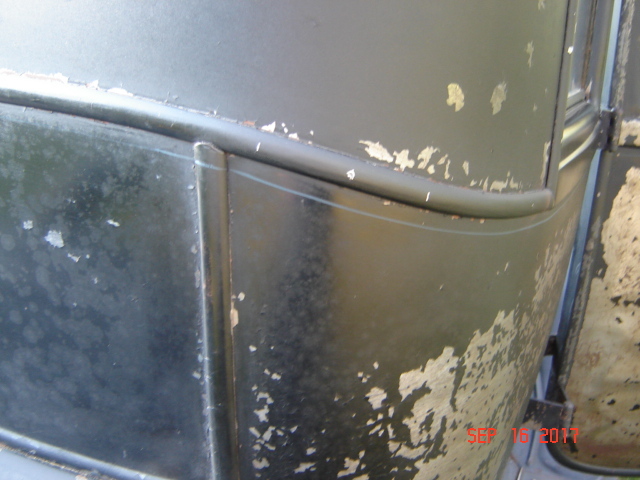 It appears that Briggs did not use a primer on these bodies before the finish coat. Are the screws and bolts on the engine side of the firewall all black, or plated? What about the screws on the window and windshield trim? Beautiful interior! 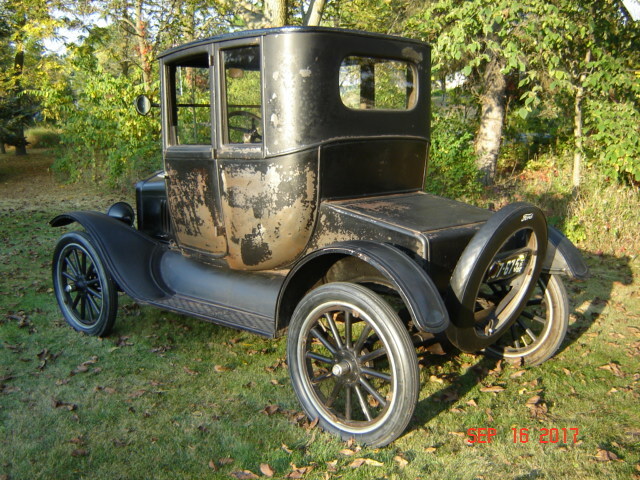 Is your coupe a 1919? It looks like the rear window is covered with material that matches the panels surrounding it while the rear side windows are painted black? 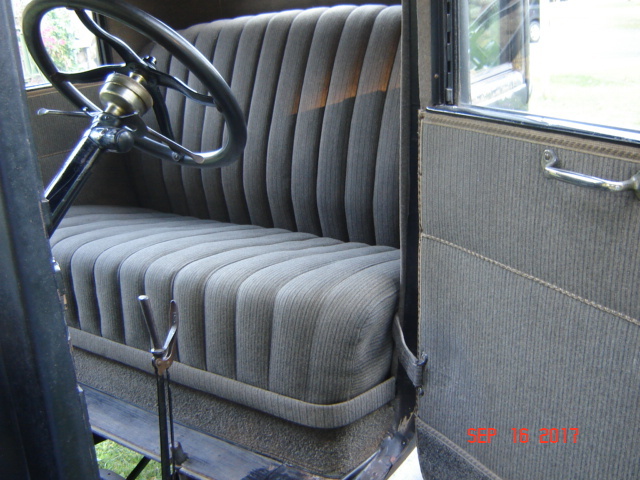 I can't find the rear side window trim, so I'm thinking about making them out of wood and painting them until I can locate the metal trim; if the rear window is cloth covered, I can proceed that way instead of making them black wood trim. 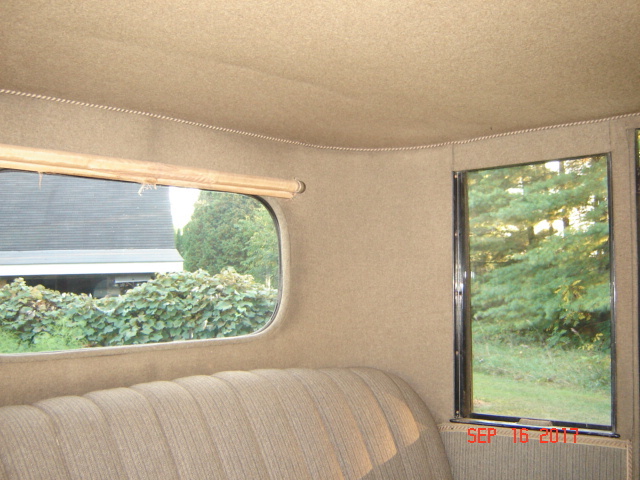 Ron, the trim around the rear side windows is wood from the factory not metal. 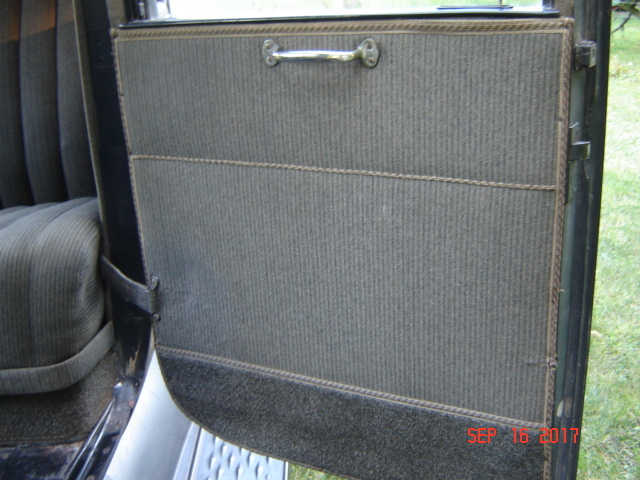 Ron, I forgot to send you information regarding the inside back window frame insert. 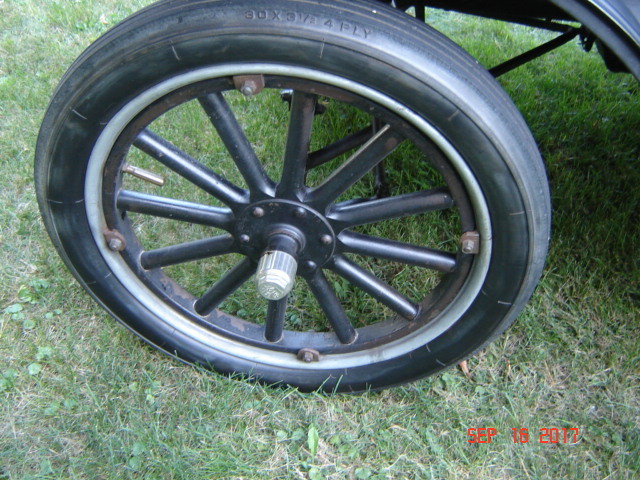 I have not been able to remove it from the 1922 body. This is how it looks to be made / used. 1. 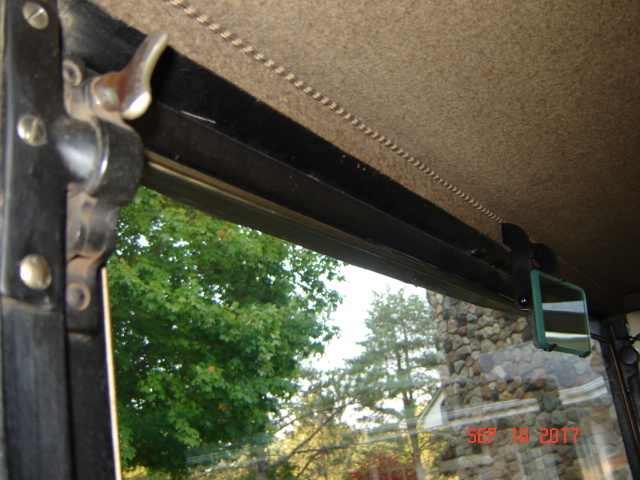 The removable retainer frame is wood but the outside is smaller dimensionally by the thickness of 2 layers of fabric material than the inside dimensions of the body opening for the rear glass. 2. 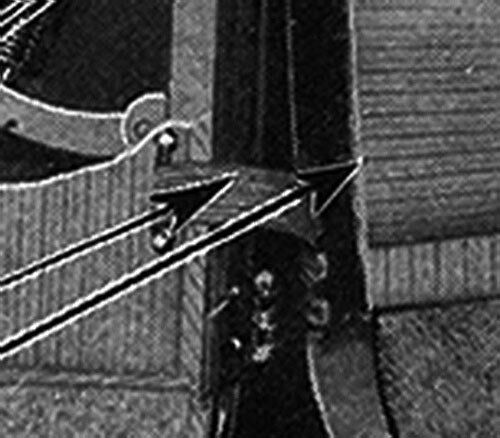 The retainer frame appears to be covered by one layer of cloth that is glued on with the fabric joint on the top center. 3. The wrap around (long) joint is totally on the outside (top, bottom & sides) of the frame insert to be out of sight. 4. 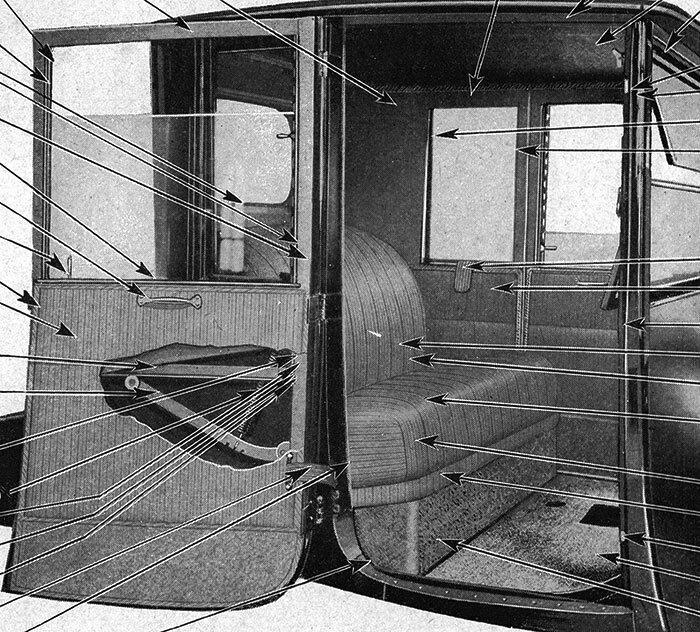 The fabric on the rear of the cab is folded in, toward the rear of the car but I cannot tell how it's held in place(tacks + glue?) 5. Obviously the glass is inserted before step #4 possibly with some kind of sealer at the metal-to-glass joint. 6. Next the cloth covered trim frame is pushed into place and looks to help hold the glass by special tacks that leave a 1/32" by 1/8" hole in the cloth covered removable frame. These "tacks" are spaced about every 3 1/2 inches apart. My guess is that the upholsterers had some sort of tacks where the head, looking from the top, was not a circle but a bar shape. My sense is that these tacks are countersunk due to final appearance of the "hole" looking like the impression that a current day wire staple, with an 1/8" span from a staple gun would produce. There is no sign of these tacks but that is where I would have to pry if I wanted to remove the frame insert. 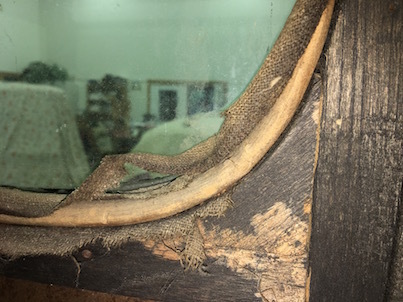 There does seem to be holes in this glued-on fabric in some places around this inside perimeter. NOTE: The cross-section of the insert frame seems to be of a quarter circle shape but with gently rounded edges at the glass and the back wall fabric.